After a blustery opening day for the 707 boats from 74 nations competing in Medemblik, the sun came out to play, and the breeze was slightly softer although still wildly variable in strength and direction. You might have thought that would make consistency difficult to achieve, but the unpredictability of the conditions did nothing to stand in the way of the Dutch 49er FX crew Bekkering and Duetz. Three bullets ensured they held on to their lead in the women’s skiff, although amazingly only by 1 point. 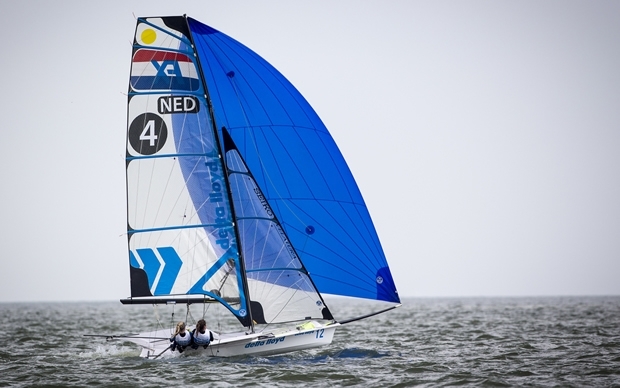 Arch-rival for Olympic selection, Nina Keizer, also had a good day but, with regular Claire Blom recovering from minor knee surgery, Keizer is sailing in Medemblik with her coach, the highly experienced men’s 49er racer Francisco Andrade. Six races completed in the women’s RS:X windsurfers, and the rising star from the Netherlands - Lilian de Geus - has won three of them. However, in the overall standings she’s still only a point ahead of two Polish sailors, Maja Dziarnowska and Zofia Noceti-Klepacka. Continuing the theme of ‘threes’, Sweden’s Fritiof Hedstrom and Niclas During have surprised many of their more experienced rivals by winning three of their qualifying heats in the men’s 49er, displacing the previous overnight leaders from the top of the scoreboard, New Zealand’s Marcus Hansen and Josh Porebski. In the Nacra 17 catamaran, Denmark’s Olympic 49er bronze medallist Alan Norregaard and Anette Viborg are the new leaders, thanks in part to a rare mistake by World No.1s from France, Billy Besson and Marie Riou, who were disqualified for crossing the start line too early in race 6. Tomorrow the breeze looks set to blow hard, and quite possibly for the rest of the week. It’s what Delta Lloyd Regatta is famous for, some hard and fast racing on the choppy waters of the IJselmeer.